Quite often I use one top light one side curve light. One thing too keep in mind covering to light adds alot of time alo in luxrender the refine brush is your friend! In my current attempt, I set spotlights angled at each window. I then put a UE on top of everything and tweeked it all a bit. This seemed to work fairly well, but still not ideal. I think I can crank up the ambient light a bit, and that might help. The problem is that when I add the UE, either a preset from Latinos Core Lights 1 or an ambient UE preset, everything, especially people, end up too dark or bleached out and ugly. Using those same presets, set to 4x, works fine in a basic portrait scene. I'm not sure why switching to an interior scene seems to cause so many problems with my various UE setups. First question of the new thread.... I'm having lots of luck now using UE and HSS, thanks to the help I have gotten here. (Thanks!) However, I'm having trouble applying my UE lights to things like interior scenes, especially ones lit by 'natural' sun light. l typically end up with really crummy lighting compared to what I am used to, either too dark or washed out or otherwise rather ugly. I've been trying to setup lights to represent the light streaming through windows, but this rarely has the effect I am going for. In these cases, the UE actually somehow seems to make things look worse! Do you guys have any general tips for using UE in a situation like this? If you are using UE indoors with mode set to "ambient" this produces renders that look like bad comic books. In "ambient" mode you have to turn UE down to a very low intensity and only use the UE light to contribute a small part of your light in order to get a decent result. If you are using UE in "Occlusion w/Soft Shadows" mode, then you have to set trace distance parameter to about 100. I think the default is 500, which is good for outdoor scenes, but indoors it causes UE to create very dark scenes. 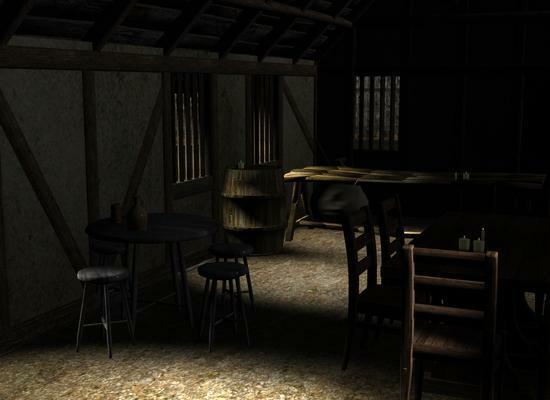 Recently I have been using a different way for lighting indoor scenes in 3Delight that does not use UE. The problem with lighting indoor scenes is creating the ambient light. You can put an UberArea light outside the windows to simulate the fact that real sunlight would be scattered and coming in the window from all directions, not just in the direction of your spot light or distant light. The Ambient light though would also reflect off the interior surfaces, especially any light colored surfaces. An unbiased render engine like Lux will trace all of that reflection off the interior surfaces, but 3Delight doesn't do this very well. In 3Delight you need to create artificial ambient light. This is what UE does, but I have discovered you can do the same thing with distant lights. A distant light with shadows turned off will go right through the walls and light up the interior. I set these ambient distant lights to be diffuse only, so they do not produce any specular highlights on anything. I typically use 4 of them, set at Y rotations of 0, 90, 180 and 270 with a small negative X rotation so they are pointed slightly down. This gives me "ambient light" coming from all directions. You have to turn the intensity down on this lights to 10-30% range depending on how much ambient light you want in the room. I have also added one distant light pointing straight up to get some "ambient" light on the ceiling. As I said, I'm far from and expert, but I have like the results I've gotten using distant lights coming from all directions to model both indoor and outdoor ambient light. If you re-read my post, I was actually agreeing with you. Less is more in the case of Luxrender. You can actually use tricks with the lights you do have such as setting up reflectors, so that you can get nice flood results without needing to position additional light sources in your scene. No such trickery works in 3Delight. I think a little of fireflies in the renders like the one below is not that bad. Rendered in LuxRender via a Luxus plugin for Daz Studio. Used only one spot light to enlighten the scene. 1530 samples/pixel. Rendering time: 2hours 30minutes. Well the very least Luxus is getting many of you on board with using Lux. After hearing that Paolo will continue to support DS with Reality. I have decided to stay with it. I am used to the interface and know that I will get desired results. R3 is going to be sick. Good thing is those of you who learn how to use Lux can then get it if you choose to. I'll reserve judgement, and my money, until I've seen what the skin shaders can do. There are still a few little details which bother me about Reality at the moment, the most glaring of which is the inability to select multiple surfaces and edit common properties in one go. Sometimes this feature works fine, but other times it only changes the setting of the last selected surface. As an example, try setting multiple surfaces to glossy translucent. It's impossible. You can click the translucency checkbox, but it only records it for the last surface you clicked on with the mouse. Equally annoying is when you deselect a surface using CTRL+Click and the properties shown are for that material type. As an example, if you select all glossy surfaces and then try to deselect a metal surface, Reality will show you the material properties for the metal surface instead of the glossy surfaces you currently have selected. Hopefully little things like that will be cleared up when Reality 3 launches, but for now they remain a serious bugbear and greatly slow down material fixes as I have to select all of them individually and change every parameter by hand. Luxus at least doesn't seem to have this issue, since it uses the Daz Studio interface for material property editing. Whichever one gets the better results is where my money will be going. I've enjoyed using Reality, but people are the central focus of most of my work and Lux really doesn't play nicely with skin tones without volumes. I've always said my main focus for Reality 3 was how it handled skin, and that remains true. Now that there's a new kid on the block though, I'll be keeping an open mind and a close eye on the results. than the other tools for LuxRender, I have tried so far. I've yet to do a Reality render which didn't require a lot of material tweaks to look right. I've not had the pleasure of comparing Luxus though, so it might be that it's still superior in it's translations. Either way, I still get better skin results in 3Delight so far. And speaking of which, I recently picked up Garibaldi. I was seriously on the fence about either getting Garibaldi or LAMH, but eventually the March Madness sale made me choose the cheaper option. I'm not even close to expertise in the plugin, having only used it for a few hours, but so far I like the results. This is the fruit of my labour recently. 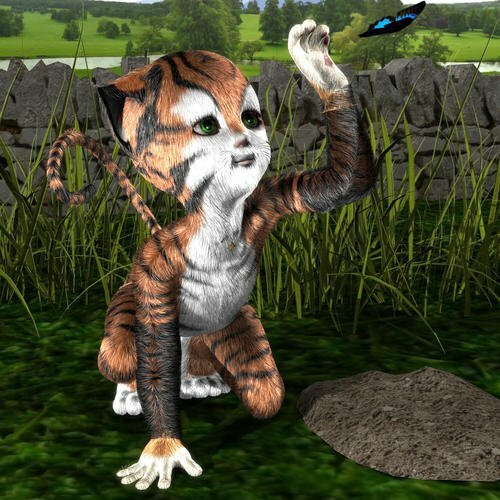 It uses the Genesis Catgirl and my own custom butterfly. Scenery props are from Merlin's Church and the Garbage Pile (for the grass). Fur is obviously done using Garibaldi, and doesn't look too bad if I do say so myself. Wow...huge help! I dialed the UE trace down to 100 from 500, and it made a HUGE difference! Never knew about that. Very interested to try the technique you have described here, also. I have tried something similar, but I was trying to create more of a direct light using an angled distant light. Never tried doing an ambient like that. Its been a while since I used UE another one if you are getting blotchy shadowing is to take the limits off Occlusion Samples and crank them up to 250 to 300 adds to render times. There are some things I absolutely adore Luxrender for. It's a powerful engine, and with the right tools it can do so much. But my real beef with Reality is that there have been few fixes or additions that aren't paid additions. That means no support for newer Lux materials and some persistent bugs. Especially some of the more annoying ones, like the aforementioned surface selections. Given that Reality isn't exactly cheap software, it's a bit disappointing. Already they're planning Reality 3.0, which might address some of the problems which currently plague 2.5, but it's a long way off for Daz Studio yet, and there's no indication of how much more it's going to cost to upgrade either. Anyway, end rant. I love Lux, and I do love the Reality plugin (despite apperances). When it fully supports the materials I use in my works, I will probably migrate to it on a more permanent basis, but until then 3Delight will still render the bulk of my work. Hi all, I'm a newbie to the thread but I figured i would drop in for a bit. I heard talk of materials! I didn't mind materials in Reality, I understood how to use them better in Reality than studio. When I render with 3DL I tend to be lazy and use premade shaders and such, so I think I had more practice tweaking in Reality than for 3DL. These days I like working with materials in Octane. I understand them a lot more than I do in studio. Although unbiased render engines are not really for stylized renders, I have been experimenting to see what I could get out. Dress material is a procedural material mix in Octane, that is part glossy and part diffuse material. Other than her skin the rest of the scene is using Octane procedural materials and not the originals from Studio. 3 curved mesh Lights and a custom extra bright HDR that I use for rendering toony stuff. That looks great, it looks like Garibaldi will definitely do what I need it to. I'm not going to lie, those do look impressive. The question I have is whether it's only using the ring of light or whether there were additional lights employed in those promotional renders. I would imagine there were no additional lights or it'd be false advertising. No additional lighting of any kind in any of the promos. What you see is what you get. Sorry, wish I had time to say more but I'm out the door to the other job right now. Will answer any questions when I get back.